Where is Pet Remedy made? Developed and made in England. Over 3000 veterinary practices, over 600 pet professionals, and 180 rescue organisations. Over 3000 veterinary practices, 180 different rescue organisations in the UK including RSPCA, Blue Cross, Battersea Dogs and Cats, and NAWT. Pet Remedy is also exported to 21 different countries around the world. How do I use the Calming Wipe? Carry with you when out and about. Wipe on hands before handling an anxious pet. Gently wipe around muzzle, under chin and top of chest of pet. Useful for noise-sensitive pets who dislike the sound of a spray. What if my dog still gets excited after using Pet Remedy? Remember Pet Remedy only helps calm excited nerves so with dogs there is still the matter of learnt behaviour to deal with. Often they will still react /behave in the same way as when stressed or anxious even if their nerve cells are calmed. For instance if the doorbell goes they will still react by barking. The advantage with dogs (and horses!!!) is that in helping calm, Pet Remedy in turn helps make the dog more receptive and attentive to you! So you can then hopefully work on behaviour modification. Will it help with cats spraying and marking? Yes – it will help. You can spray a little in the area they choose to spray in or mark. Also spray a little on their bedding as this will help draw them away from the area in which they have been inappropriately spraying and marking. Will it help with cats scratching furniture? Yes – it will help. Although you can spray a little where they are scratching inappropriately it is better to spray on a scratching pole as this will draw them to where you want them to scratch! Will it help with Travel? You would think a dog would be quite happy travelling alongside its owner. But this is not always the case! Stress in dogs (and other pets) when travelling is often caused by a constant and rapid change of scenery which they find hard to cope with. Best way to use Pet Remedy in this situation is to use a little calming spray on the bedding in the car. A couple of sprays is usually enough. Will it help with Separation Anxiety and Home Alone Syndrome? The plug diffuser will help as ambient and constant slow release. Use in room where your dog (or other pet) spends the most time when you are absent. Actives are drawn up the bottle wick into the surrounding area and then carried by air movement around the room. Also use the calming spray. Spray a little on bedding, on a bandana, or even on your fingers or a damp cloth and gently rub around muzzle, under chin, and top of chest of pet. With separation anxiety, your dog (or other pet) can settle more easily if the nerves are calm rather than going into shut down and reactive behaviour mode (barking, pacing, chewing, soiling, etc.) which often happens when the pet is stressed and the nerves are fired up. Can I use Pet Remedy with puppies or kittens? Yes… safe to use as very gentle in its effect. Will it help with fireworks and other noise phobias? Yes… use both the plug diffuser and calming spray. How do I use the Battery Operated Atomiser? Locate where your pet spends most of its time. Set to atomise every 30 minutes. But you can set to 60 or even 120 minutes if you want to reduce the frequency of the activation of the spray. Can be wall mounted if required. How do I use Pet Remedy for bonding rabbits? Spray a little on a damp cloth and wipe over each bunny in turn and repeat a few times. This is called scent swapping and helps both bunnies smell the same. Do this before and after each bonding session. You can also spray a little on inside walls of hutch or on a cloth and hang in hutch. If indoors also use the plug diffuser! How long will the spray last? At least 2 hours and up to 6 hours or more, depending on the individual pet. How much of the calming spray do I use? You only need a couple of small sprays for effect. How do I use the Calming Spray? The calming spray is water based and PH neutral which means it is safe on skin and the coat of your pet. Use on bedding in the home and car, bandana, or even spray a little on your fingers and gently rub around muzzle, under chin, and top of chest of your pet. If out walking an anxious dog and you anticipate an adverse situation, you can spray a little on your trouser leg and bring your dog to heel to take in the actives. Pet Professionals spray on the front of their tunics, cuffs and hands when handling an anxious pet. They also spray on work benches before handling a stressed pet. What is different about the plug diffuser and calming spray and wipes? The effect is more localised and immediate. Do I leave the plug diffuser switched on all the time? Usually best to leave switched on all the time for most situations.But if using for separation anxiety (home alone) you can opt for switching it on only when you leave the house. How long does the plug diffuser liquid last? How often do I replace the plug diffuser? Usually best to replace after 4 uses. Can I use the Pet Remedy diffuser bottle in any other type or brand of plug diffuser? No… as the special liquid blend is not compatible with other plug diffusers even if the bottle fits! Our plug diffuser operates at optimum temperature for the Pet Remedy diffuser oil based composition. Where do I Iocate the Plug Diffuser? In a room where your pet spends the most time. What is a Plug Diffuser? A plug-in diffuser is only a device with a heated ring which creates warm air. This warm air then rises drawing the actives up the wick into the surrounding area. The plug diffuser delivers constant slow release of liquid and is very gentle in its effect on the metabolism. Does Pet Remedy smell of anything? The formulation comprises a unique blend of absolute and essential oils. Valerian has a distinctive earthy and quite pungent aroma. This derives from the acids in the oil (valerenol and isovalerianic acid) which we cannot neutralise without compromising the special calming properties. So instead, we work with this aroma and blend the Valerian absolute oil with Vetiver, Basil, and Clary Sage, which all have their own distinctive smell and individual calming properties. It is a synergy of these oils working together which delivers the gentle Pet Remedy calming effect on your pet. You can easily identify in the aroma, the small inclusions of Vetiver (a reedy grass from Indonesia), Basil and Clary Sage essential oils, which help balance the smell. How will this help my stressed pet? When stressed, a dog for instance, can go into semi-shutdown mode where he or she is no longer listening or taking in what is going on. This can lead to reactive behaviour such as barking, soiling, chewing, pacing, and aggression. Once calm the dog comes out of this state and becomes more aware of surroundings and more receptive to you so that you can then work on confidence building. 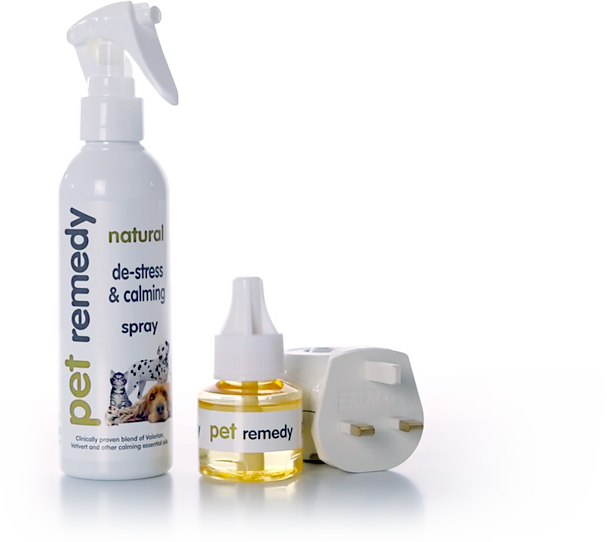 Pet Remedy will also help all other mammals such as cats and rabbits, and even birds and reptiles, when they are stressed or anxious, by helping calm their nerves. This in turn will help them become more aware of surroundings and more settled. Can I use Pet Remedy if my pet is on medication? Pet Remedy is very gentle in its effect so safe to use in most situations, but always consult with your vet first. When can I use Pet Remedy? Will help with fireworks, travel, separation anxiety (home alone), loss of companion,new home, new pet in house, change of routine, visit to vets, aggression, spraying, soiling, over grooming, as well as many other symptoms caused by stress. and individual calming wipe sachets. The actives in the Pet Remedy formulation mimic a natural calming message from the brain called GABA. Nerve cells in any mammal, bird, and reptile are only ever fired up or calm. Pet Remedy works with the pet’s own natural calming mechanisms and is formulated using low concentration Valerian absolute oil with small inclusions of Vetiver, Basil, and Clary Sage essential oils. When stressed or anxious, nerve cells are fired up and this is when the actives in Pet Remedy act by tricking these fired up nerve cells into thinking they are getting a message to calm.